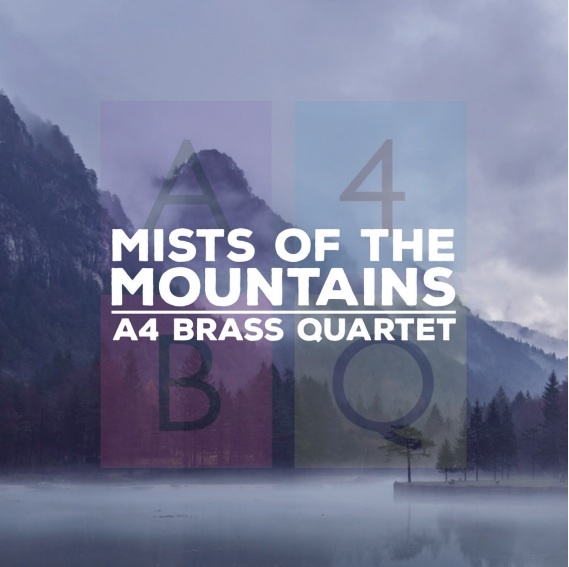 CD - Mists of the Mountains - A4 Brass Quartet - shipping NOW!! Here is the brand new debut CD release from perhaps the 'hottest' new brass ensemble in the UK today. Welcome to the debut CD of the award-winning A4 Brass Quartet. Formed in October 2013, the quartet members have roots in British brass banding, with all players holding principal seats in some of the country’s top bands. Whilst adhering to these original roots, as a group they continue to develop and commission new repertoire. The quartet has a unique blend of instruments, with a cornet, tenor horn, baritone and euphonium creating a distinctive sound that stands out from the standard brass quartet. This CD features original music by some of the leading composers in the UK and Europe, who have written works specifically for A4 Brass. These composers include Martin Ellerby, Edward Gregson, Oliver Waespi and Nigel Clarke to name a few. 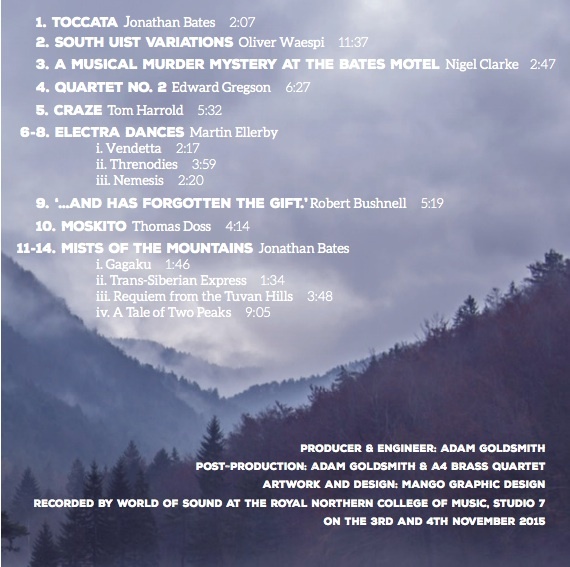 Mists of the Mountains by the quartet’s very own Jonathan Bates is the piece that the group won the Christopher Rowland Ensemble of the Year Award with, so poignantly features as the title track of this debut CD. 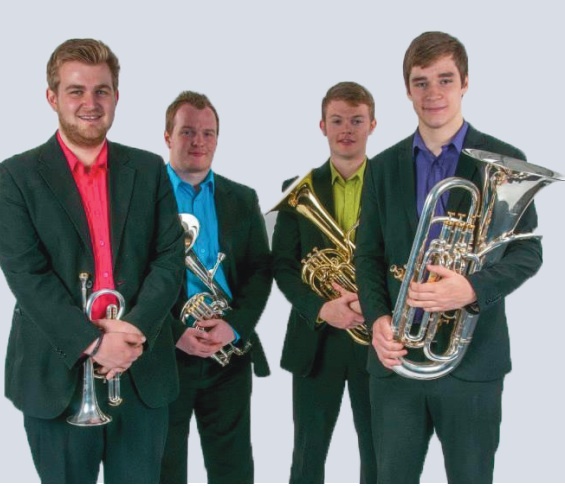 Based at the Royal Northern College of Music in Manchester, England, A4 Brass is comprised of principal players from some of the UK’s leading brass bands, including the world famous Black Dyke, Grimethorpe Colliery, and Wingates bands. The quartet has a unique blend of instruments, with a cornet, tenor horn, baritone and euphonium creating a distinctive sound that stands out from the standard brass quartet. The great technical capability and musical versatility of the quartet was recognised by the Royal Northern College of Music in the group’s first year together. Firstly, the quartet won the Philip Jones Brass Ensemble of the Year prize and after consequently being invited to represent the brass department at the overall prize, went on to win the Christopher Rowland Ensemble of the Year Award, claiming both the judge’s and audience vote. The quartet perform concerts and masterclasses all over the UK, and 2015 saw the first mainland European excursion for A4 Brass as they accepted the invitation to perform in the Trakai Fanfare Week in Lithuania. The quartet has also featured on national television and radio, most recently for ITV’s 2015 Christmas Carol concert and live on BBC Radio 3 for their ‘In Tune’ broadcast in December 2015. Further performances have taken the quartet to the Isle of Man; St John’s Smith Square, London, as part of the Philip Jones Celebration of Brass and the Lake District Summer Music Festival. A4 Brass Quartet perform exclusively on Besson Musical Instruments and are kindly sponsored by Chalker’s.